There are two maxims that accurately and tersely define the internet: 1) the internet is a series of tubes, and 2) the internet is made of cats. This was never more true than it was in 1897. 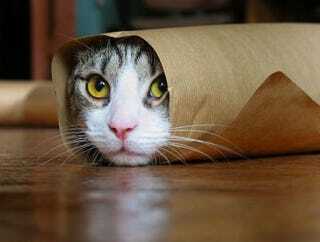 When the New York City's General Post Office's pneumatic tube system was launched, some brave engineers apparently demonstrated the system by stuffing a kitty in a tube, among other things. The cat was fine. "Dazed," but fine. Presumably, when the late Senator Ted Stevens referred to the internet as a series of tubes, he was reminiscing about his childhood spent shoving cats into capsules and shooting them like cannonballs through the elaborate network of pneumatic tubes—which really isn't that bad of a metaphor for the internet. A series of tubes full of high velocity cat capsules. The Atlantic has the full story. UPDATE: More like Hypurr Loop amirite.